I'll admit, I went into this episode with high expectations. As someone who knows the career of renowned comedian Louis C.K., it is no surprise that I surged forward on my couch with a bowl of popcorn and bottle of water to spit-take with. As Louis continues his web series Horace and Pete, he brought a whole new breath of fresh air to this episode of Saturday Night Live. 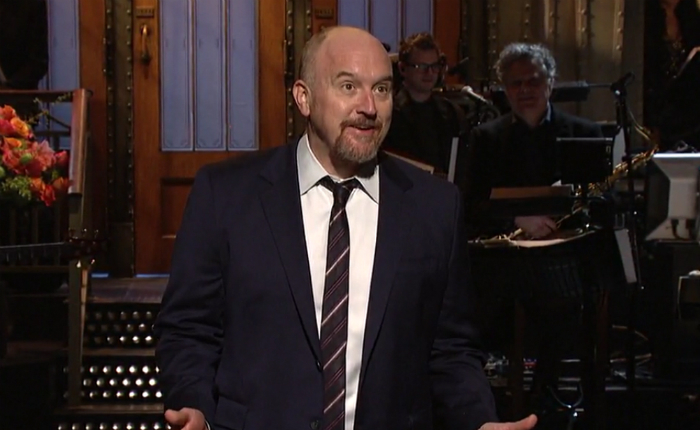 Having hosted Saturday Night Live previously in seasons and unsuccessfully auditioning for a spot as a cast member on the show in 1993, Louis is no stranger to Studio 8H. Realistically, I think the majority can agree that Louis isn't a stranger to anything that is remotely funny. Despite his failure in gaining a spot in the cast of Saturday Night Live that year, he gained his first Television writing job through the show and went on to build himself one of the most highly respected stand-up careers today. Watching him host Saturday Night Live now seems to be a tip of the hat from Lorne Michaels. The show starts out with their cold open starring, you guessed it, Alec Baldwin as President Donald Trump. The sketch hit the nail on the head in terms of it's realistic qualities, focusing on how Trump supporters who once voted for him have to deal with the unavoidable consequences that the rest of the world knew would follow behind his presidency. The sketch compares his voters support like finding a finger in your chilli, but continuing to eat it- because you told everyone you liked chilli. Once again, nail; meet head. It is no surprise that Saturday Night Live has and will continue to have a strong critique on Trump's presidency, so when a cold open starts with him being put on blast for the promises he's made and his attempt at quick fixes; the joke lands well. Even if we have heard it one thousand times. Hosting the show overall seemed natural for C.K. His cool, relaxed posture and can-do humour hooks your attention, and his monologue kept mine. Filled with whacky jokes about numerous animals you'd find at the zoo, he uses chickens at a metaphor for racism and five star hotels for white privilege. It was funny enough to make you laugh, and whacky enough to make you question why you watch comedy in the first place. If anything, C.K. 's monologue was a hint to viewers that show will be a little kookier than normal. Welcome to Louis C.K. 's humour. Overall, the monologue flew without problem. The next sketch we're given takes place in a court room with the defence attorney (Bayer) trying to sway the judge (Thompson) to keep his attention on the actual court case instead of being taken with the prosecutor (C.K. )'s long luxurious eyelashes. Although it comes out quickly that the defendant is guilty thanks to his friend (Davidson) being swayed into the truth with the power of his drag-esque lashes, the skit twists and turns into a Maybelline commercial. Maybe he wasn't born with it after all. The episode's first pre-tape sketch of the night was an ode to the social media saviour. "Thank you Scott" focuses on the people who sit on their phones sharing posts of how awful everything in the world seems to be, but don't care enough to do anything about. Poking fun on this issue was not only fun to watch as it was filmed as a music video, but made me feel a deep burning shame that everyone reading this probably feels. We're all in the same boat. Watch it here and feel the shame all over again. Having Mikey Day as a white rapper filling the bridge was also very, very clever. Bravo. Soda Shop, the skit that made me tilt my head in slight confusion. I understood the concept of a perverted man running a soda shop in the 50's, and C.K. spewing crude comments at Vanessa Bayer's character was oddly hilarious, but overall the sketch fell flat and remained questionable. However, Leslie Jones rocked that costume. The top sketch of the night followed closely behind. Following the recent Pepsi commercial controversy with Kendall Jenner, there was no question as to whether or not I expected to see a sketch about it in tonight's episode. The commercial that has raised many eyebrows the past week was put onto the chopping board and mercilessly torn to shreds through silence. Beck Bennett portrays the director who is seemingly chewed out on the phone after explaining the concept of the video. We watch in hilarious quiet as he receives honest feedback from his sister, and then other people he attempts to riffle through. The sketch wraps up with Cecily Strong portraying Kendall Jenner who is bragging about the idea on the phone, and gets only positive feedback from a presumed airhead friend. As long as Kendall thinks it's cute, so does everyone else- right? The sketch ends with a slogan to end all slogans: Live and Learn. The musical guest The Chainsmokers performances were those to be questioned. Mostly talking in place of singing through synthetic beats isn't my cup of tea, but it may be yours. No judgement here. Weekend Update started just as it ended, with Trump jokes. Then again, if Trump would stop doing things that Saturday Night Live could stop parodying, we wouldn't have to hear about him as much, would we? A pleasant surprise was inserted by Kate Mckinnon's Cecilia Giménez, the artist who accidentally made herself famous by butchering the restored (for a lack of a better word) "Jesus" painting. She showed up critiquing the recent hilarious bust of Christiano Ronaldo, a very well played and clever move on Saturday Night Live's part. Watch here. Alec Baldwin surprises the audience and returns in The O'Reilly Factor to portray the Fox News reporter, who has recently had more than 50 advertisers pulled their ads from his show following 5 harassment cases were settled against him. Baldwin then surprises us again by playing Trump in the sketch as well, who as always is ignorant to the scandal and claims he's too busy with healthcare and bombing other countries. The sketch tries to emphasize with 500 yard jokes that with the harassment cases that have been filed against both men, they're strikingly similar. The sketch, while attempting to point these things out and bring them to the public eye, still made me scrunch up my nose. Dodo the clown allowed Bobby Moynihan to show off his acting chops as a confused children's party clown who has to perform for a 53 year old man sitting on his couch drinking a beer, not a child in sight. The jokes landed well, and the pre-tape was well received. The ending although dark and twisted, was worth watching the sketch in it's entirety alone. A strange quirky sketch follows Dodo the clown, proving hard to follow up a pre-tape like that one. The sketch, while seeming to follow the structure of a furniture warehouse ad, actually just turns out to be a crazy guy who loves sectionals and has far too many he's not willing to sell with Cecily Strong's opera stylings and Aidy Bryant's "Barb" peppered on top. Seriously, don't come to his warehouse and try to buy his sectionals. Just don't do it. The final sketch of the night could have been a standard, forgettable one about Polish people in 1913. What made the ten-to-one so special was the dynamic duo of Mckinnon and C.K. being unable to hold in their giggles at their off-the-mark Polish accents and lame jokes about greasy Italians. The sketch turned out to be a blunder, but hilarious overall with the help of Kenan Thompson's skeptic high school student. The episode was overall a hit. Typical to Saturday Night Live however, the addressing of sexual assault is one to question when Louis C.K. himself has a reputation of being a bit of a perv in the comedy community, having several allegations placed against him, making this episode, much like that of Casey Affleck's, hard to enjoy when you actually question it. I know, it's cute, right?